How many ways can you use a self-contained, high-precision signal source contained on a 1" x 2" plug-in circuit card? How about as a stand-alone VFO, a signal generator for your bench, a replacement LO for your Sierra or NC40 transceiver, or perhaps as the heart of an antenna analyzer! Control it with your favorite microcontroller, or even hang it off your PC's printer port. Any way you do it, you'll be generating quality signals for under $20. It'll work directly with the PIC16F84A and the "siggen3" PIC DDS VFO project that started this whole craze. One can get the PIC code from the HamPIC Resource Page (http://www.njqrp.club/ham-pic/projects.htm) and program the PIC directly to control the DDS Daughtercard. Adding a rotary encoder yields a project that is a good VFO with bells 'n whistles designed by Craig AA0ZZ and Bruce AA0ED. 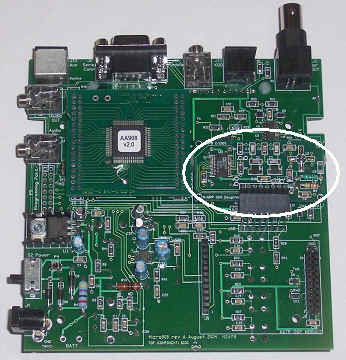 It plugs directly into the NJQRP QuickieLab (http://www.njqrp.club/quickielab/index.html) to give that BASIC experimenter's platform RF generation capability. With the canned software available for this project, along with Joe Everhart's wonderful "Quickies" and "Test Topic & More" columns that focus on its use, this is probably the easiest and most flexible way to play with a DDS. 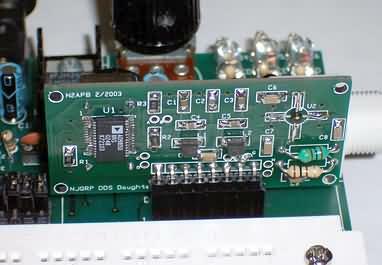 Photo of DDS Daughtercard plugged into the NJQRP QuickieLab project. Prototype DDS 'card is shown on the left, and the production version is on the right. Note the small board space actually required for this VFO function. Of course you can also design the DDS Daughtercard into your own custom project, using your favorite microcontroller chip as the “brains”, be it a PIC, Atmel, Ubicom, or 8051-derivative processor. The possibilities are limitless! 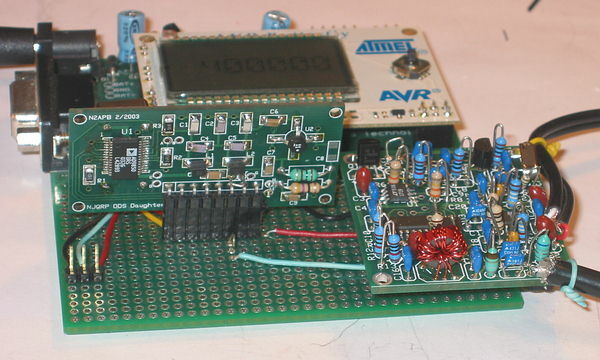 The DDS Daughtercard is already incorporated into the Micro908 kit from the AmQRP Club and is integrally used to make the instrument function as an antenna analyzer. So if you are able to write a specific VFO program for the Micro908, or perhaps just use the VFO function provided with the AA-908 software load on the Micro908, you can use the instrument to generate signals “right out of the box”. Is controlled by the HC908 Daughtercard on the Micro908 motherboard. off the motherboard, above the reflectometer circuits of the Micro908. The HC908 Daughtercard controller is a popular and recurring component with the DDS Daughtercard. Together they make a flexible combination of modules that can be used in many different applications, using a common set of software libraries (subroutines). The configuration of the two modules shown in the right photo is the minimal hardware arrangement needed for a “dumb terminal” (like HyperTerm on a Windows PC or ProComm on a handheld computer) to command the HC908 to generate frequencies … in effect, the HC908 and DDS daughtercards become a remotely-controlled signal generator! Control the NJQRP DDS Daughtercards from your PC. The DDS-330/60 cards can be easily wired to the printer cable on one's PC and controlled by a program running on the PC. All you need to do is wire up the parallel port cable to the DDS card as shown below and then run either of two programs: DDSFreq (by WA6FXT) or "DDS Controller" (by WA6UFQ). Connect the DDS Daughtercard to the parallel (printer) port of a PC, turning the PC into the 'control panel" for your VFO. The DDS Controller now has fifteen user programmable configurations, or bands. Each of the fifteen bands have twenty memory cells for saving and recalling frequencies. The screen snapshot below shows the DDS Controller programmed as a VFO for a 6M transceiver. Features of the DDS Controller include the ability to scan memory cells, and sweep the VFO's frequency spectrum at various sweep rates and frequency steps. The DDS Controller can be programmed with a frequency offset for use with a superhet receiver/transceiver, or it can output at 2X, or 4X the displayed frequency for SDR service. The output frequency of the DDS VFO can be changed by direct keypad entry or by using the UP / DOWN keys on the keypad. The DDS Controller can also be configured to use a non-standard reference oscillator frequency. And now the DDS Controller outputs band information to the parallel port interface. Saves the last frequency used at shut-down for use at the next start-up. Remembers the last VFO tuning step when moving from band to band. Saves the position of the DDS Controller on the Desktop at shut-down, and starts up at that position. DDS Controller outputs a four bit word to the parallel port with band information that can be decoded to control filters, etc. Supports fifteen bands, allowing for HF + 6M, as well as four 'Aux' bands. Frequency display can be offset to allow for 'LO Above' or 'LO Below' when used in Superhet configurations. Interfaces with parallel ports LPT1, LPT2, and LPT3. Has option to use a non-standard reference oscillator frequency. 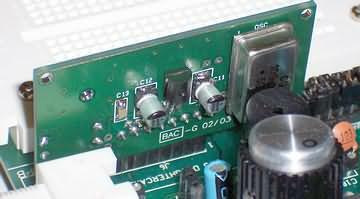 Works with the AD9851 chip (60 mHz), as well as the AD9850 chip (30 mHz). Has option to enable/disable the AD9851 X6 multiplier. Has 20 memory cells per band. User programmable Scan and Sweep functions. Outputs at 1X, 2X, or 4X the displayed frequency to accommodate various Software Defined Radio configurations. Download the installation package for the DDS Controller program, v2.4.1. DDSfreq, by Mike Hasenfratz, WA6FXT, serves as a VFO 'front panel". This Windows program presents a window with settings that can be entered for frequency, phase, serial port, and start/end frequency, which instructs the program to continually update the DDS programming register with the next frequency in the series. I've been corresponding with Diz (W8DIZ) and without letting out too many of his plans, he said he's also working on some ATmel code to drive the DDS Daughtercard. I think this is just great! [I've got to get myself set up with an ATmel development station of some sort.] So pretty soon we'll have another microcontroller that one could connect up to the DDS 'card. Here's an example of the DDS Daughtercard (the prototype version) plugged into a specialized project. Again, note the small space needed to fit the DDS 'card. There's been some discussion over the past couple of years concerning how one could build a very stable frequency generator suitable for lab bench work. This entails using a DDS (or a PLL and DDS combination) to generate the stable and variably-controlled frequency source, and the precise control of attenuation on the output of that signal source. We're working with an individual who thinks that the DDS Daughtercard may be the way to go at the heart of that design. KD5TFD writes: "When I built my SoftRock-40, I wanted to perform some experiments and pair it up with a DDS Daughter Card from the AmQRP to give it more tuning range, so I replaced some of the components on the SoftRock-40 board with headers so I could tie-in the DDS signal from the daughtercard. Using an NJQRP DDS Daughtercard and an Atmel AVR Butterfly controller card, I was able to create a VFO using KD1JV software. I figured this would make a good LO to drive the SoftRock-40, so I connected them all together using a carrier board from ERCOS Technology, with the result shown below. " SoftRock-40 (on right) being controlled by an AVR Butterfly card driving an NJQRP DDS Daughtercard, thus replacing the fixed crystal oscillator and allowing the SoftRock-40 to reach across the entire 40m ham band. These are all "food for thought" and ideas for the workbench ... if only we all had more time to explore them! The beauty of this approach however is that there's likely at least one idea listed here that has the ability of striking the sweet spot for homebrewers on the list.